"You have entered a wrong password" - this message won't be a big problem for you in case you've got Password Recovery Engine for Outlook Express installed. this software download successfully restores your mail passwords, identity passwords, logins and news accounts passwords. The simple and cozy interface makes work with the program especially pleasant. Here you can save password data to a file or clipboard, so that your passwords are always at hand. 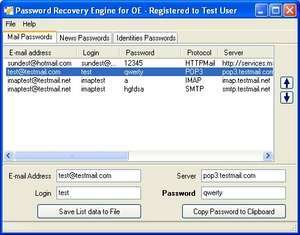 Password Recovery Engine for Outlook Express 1.3.0 is a shareware program and can be used as a demo to try the software until the free trial period has ended. A full version of the program is available after the trial period ends. For security reasons, you should also check out the Password Recovery Engine for Outlook Express download at LO4D.com which includes virus and malware tests. Additional screenshots of this application download may be available, too.